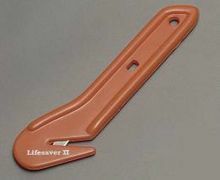 Lifesaver II seat belt cutter has a built in O2 wrench, quickly cuts through seat belt or web belts etc. Easy to grip, even with gloves. Easy to replace blades. Replacement blades come in pack of 4.